Liverpool’s Mando has upgraded the key digital planning platform for Transport for London (TfL). WebCAT, or “Web-based Connectivity Assessment Toolkit” is used by planners in London when they’re building new houses or developments. It measures public transport access levels, to produce travel time reports. The latest update by Mando also shows heat maps to illustrate how well-connected an area is to public transport and cycling infrastructure; travel times from any location in London, including the number of people, jobs, towns centres and schools within certain time bands; and new comparisons between different scenarios, such as cycling and public transport on the network now - and in the future. “We’re really excited to have collaborated on this project with Transport for London, as they’re one of the world’s leading transport brands and one of the perennial symbols of London,” said Mark Simpson, client services director at Mando. Mando reviewed the user experience, stories and existing wireframes, before doing the development work. 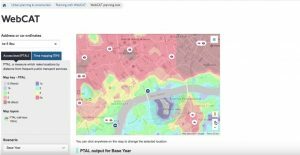 “London’s planners have a huge challenge ahead of them and WebCAT is a great toolkit which has already provided them with lots of useful data. We have now upgraded it to include a variety of new features, such as how many jobs and schools are nearby. This means that a wider range of people, for example property developers or residents, can now use it to find out more about specific locations in London and help plan what London will look like in the future,” added Alex Williams, acting managing director of planning.